Picture perfect smiles look great, function properly, and they increase confidence for many people. However, only a few of our patients naturally have a gorgeous smile. At Blue Sage Dental, we offer a wide array of cosmetic dentistry services to deliver the flawless smiles of our patients’ dreams. Many people think the only way to get a gorgeous smile through cosmetic dentistry is to invest a large amount of time and money in an advanced smile makeover plan, but there are actually quite a few cosmetic treatments that can be completed quickly with minimal discomfort. Porcelain veneers are some of our most popular smile transforming treatments. In most cases, we’re able to completely transform your smile using porcelain veneers in just two short trips to our Littleton dental office. If you’re interested in enhancing your smile’s natural beauty, give the Blue Sage Dental team a call to schedule a cosmetic dentistry consultation. We’ll evaluate your smile and help you get the results you want within your schedule and budget. Veneers are thin sheaths of dental grade porcelain. These veneers are affixed to the front facing surfaces of teeth to correct and conceal any number of cosmetic flaws, including chips, cracks, stains, and gaps in the smile. Porcelain veneers are placed over the course of two trips to our office. During your first appointment, we prepare the teeth by removing a small amount of surface tooth structure. This allows the veneer to lay flat within the smile. Then, we capture impressions of these prepared teeth that will be used by our lab to create your veneers. Finally, we place a temporary porcelain veneer to protect your prepared teeth and allow you to get used to the look and feel of your veneers. When we receive the final restoration from our lab, you’ll come back for your second visit. During this shorter follow up appointment, we’ll remove your temporary and place the custom porcelain veneer. Following the placement of your porcelain veneers, you’ll need to take special care of these quality porcelain restorations. Unlike other restorative materials, porcelain is stain resistant, so your flawless look will last. However, you do need to take the necessary time to care for your smile in our office and at home. Use a soft bristled toothbrush and minimally abrasive toothpaste to brush your teeth while minimizing porcelain wear. You should brush at least two minutes at a time twice a day. You should floss at least once each day, and you may want to switch to a waxed floss in order to avoid catching on the edges of your veneers. 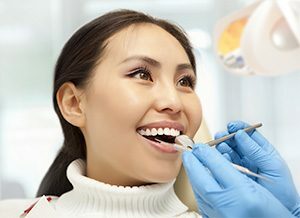 Finally, keep up your six month dental checkups, so we can help you extend the life of your porcelain veneer with preventive treatments and minor repairs when necessary.